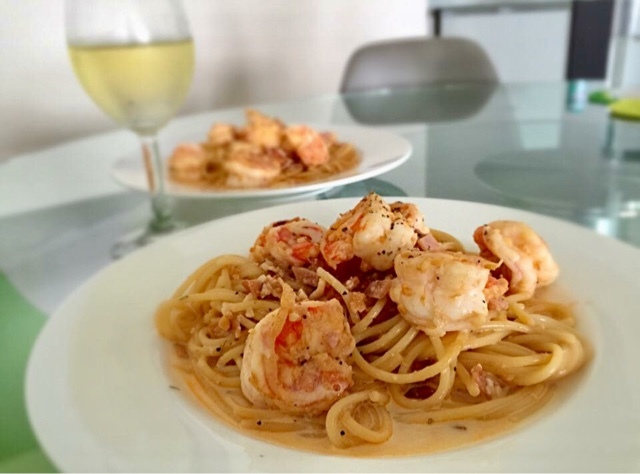 How to cook White Wine Pasta in Prawn broth? To cook an alcohol infused pasta, the secret lies in the timing when we pour the alcohol into the cooking. Arriving at the wet market, I was lured by the array of fresh seafood. Oh my, look at the huge fresh prawns, perfect for cooking pasta. I deshelled the prawns and kept the precious prawns shells aside. The secret to any prawn broth lies in the shells, not the flesh. I boiled the Spaghetti to al dente. This really depends on your preferences. Some prefer firmer and others softer. If you are pressed for time, just use Angel Hair instead of Spaghetti. Angel Hair takes only two mins to cook. I strained the cooked pasta and left it in another bowl. Usually, I will add a small amount of olive oil to the pasta to prevent it from sticking to each other. Shells Shells Shells! It was time for the shells to shine. I added a small amount of oil onto my pan and waited for it to be heated up. If you are a garlic lover, add a small amount of chopped garlic to enhance the flavour. Be careful not to burn the garlic. Time to add the shells, the more the merrier! When the shells turned a fiery red, it was time to add the prawns and white wine. At this stage, the white wine serves to give the prawns a winy taste but not the dish. Most alcohol would evaporate very quickly upon cooking. 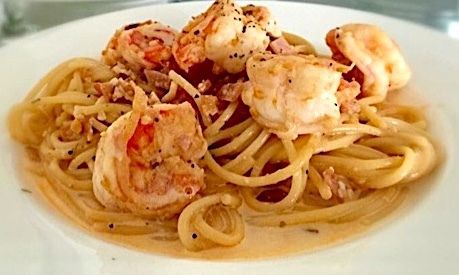 The secret to any seafood pasta is to prevent it from being overcooked. Once overcooked, the seafood loses its firmness and freshness. The moment the prawns were cooked, I removed it from the pan. By now, the aroma of fresh prawns , shells and white wine would have permeated the entire kitchen. I added the pasta and fresh milk or cream, giving it a good toss. If you choose cream, you might need to add a little water. The dish would begin to reduce into an orangey thick broth. Just before it was going to be served, I added all the prawns and another round of white wine into the dish. I quickly turned off the stove to ensure that the white wine would not be evaporated. The dish was ready to impress! Enjoy!